I have something of a history with The Way of Tea. This time last year, Mr. Aaron Fisher posted me a copy of his book to review. It was a warm Hilary term, and I remember reading it in between giving tutorials in my college of the time. I sat in my favourite armchair in the SCR, looking out over the back quadrangle - which is more a big expanse of grass bordered by large pines. In the picture below, my old friend, the armchair, was positioned in the full light of the second window to the right of the door. The grandfather clock ticked heavily nearby, the lapsang-and-lemon steamed in a chipped little cup on the windowsill, and the pages of Mr. Fisher's book came and went. It's a pleasant memory of a happy time - I have since moved to the other side of town, where the SCR is a little more traditional, and a little less like my grandmother's parlour. My dear grandmother passed away that year, too, and so the impression left by my old college's rooms seems poignant. During that time, I was also sanding down a long staircase in my house. It was, unsurprisingly, a dusty job, and I remember picking wood-dust out of my ears for days afterwards. Throughout one entire eight-hour day, spent sanding that staircase, I debated with myself about how best to write about Mr. Fisher's book. I couldn't solve the problem, like a good koan, no matter how much I turned it around in my mind's eye. 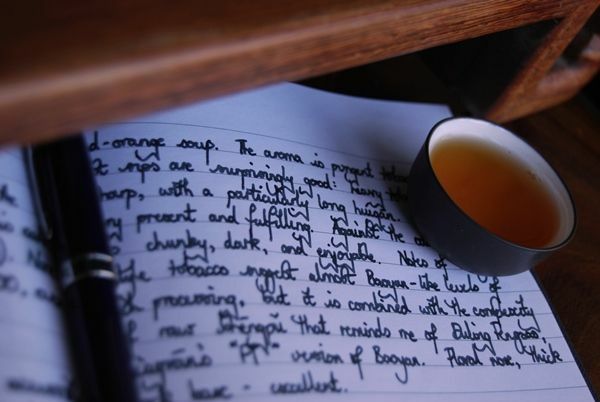 The term carried me onwards, in its ever-increasing schedule of research, tutorials, and revision classes, and the task of writing about The Way of Tea slipped to the back of my mind, and, eventually, out of it. Last week, our house renovations completed in one of the downstairs rooms, we unpacked our boxes of books into the bookcases that had just been erected. Among with all of my old companions, from Crime and Punishment to Green Eggs and Ham, was The Way of Tea. What do you make of tea books? To my tastes, the field from previous years is rather rotten - so many feel rather amateurish, filled with mistakes, are poorly-edited, and contain cliches that a competent editor should have removed. Given my consistently unsatisfactory prior experience of books about tea, Mr. Fisher's book always had a long way to go to win my affections. Like that day spent sanding my staircase, I still find it difficult to write about - just like it is hard to write about the way one wrestles with a koan. I do admire Mr. Fisher's obvious commitment and passion to the world of tea. Many of us will be familiar with his on-line tea magazine, The Leaf, which he makes available for no charge. This is an act of generosity that we must appreciate, because it must take a great amount of effort to produce. Similarly, I very much admire Mr. Fisher's paintings and sketches, one of which is reproduced from The Way of Tea in the image below. They follow a classically open oriental style, even touching on Zen painting in places. If you will forgive me for doing so, one could almost use the word "sumptuous" to describe his artwork. Finally, I feel that Mr. Fisher and I would have a great deal to talk about over a cup of tea, given that some of our interests align so clearly. 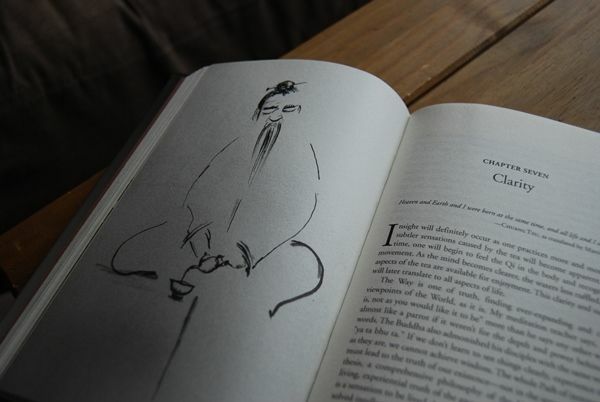 His topics include tea (of course), frequently mention Daoism, and make reference to Zen. These are subjects that are dear to my own mind, as long-time readers of this humble web-site may have concluded. Indeed, if it was not the Half-Dipper that inspired chapters on ceremony (Mass, Ritual, and Tea) and cleaning up after a session (Ending a Session), then we at least share similar opinions. So, then, where is the difficulty? Why all the fuss during that long day of sanding? This is quite a lot of writing. I am not a great writer, nor a great poet, but I think it's fair to say that I am a solid "work-a-day" artisan. While not one who could produce a Mona Lisa, I could have a good attempt at providing something that looks at least pleasant, literarily speaking. Much of whatever small talent I have comes from working directly with my supervisor, a senior chap, whose quantity of red pen on my writing is matched only by the quantity of red pen that I now inflict upon my own students. The dreaded red pen taught me a great deal about how to write, and how to think. So, while not a literary talent by any means, I feel that I am least sufficiently able to get a piece of text into shape. My concerns with The Way of Tea, then, are almost entirely those of style and construction. 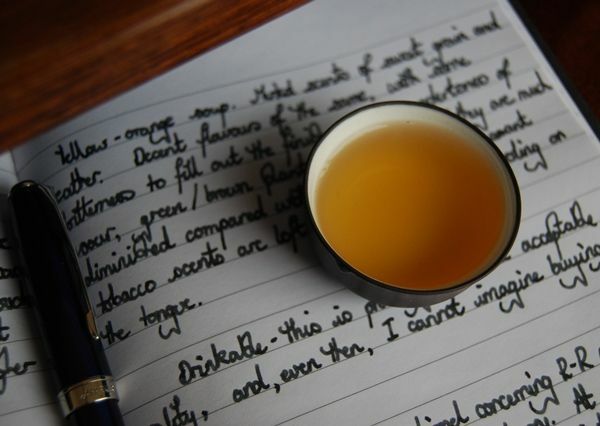 If you like the style in which Mr. Fisher writes The Leaf, or the style in which he writes his informative articles in The Art of Tea, then you will surely take away a great deal of pleasure from The Way of Tea. 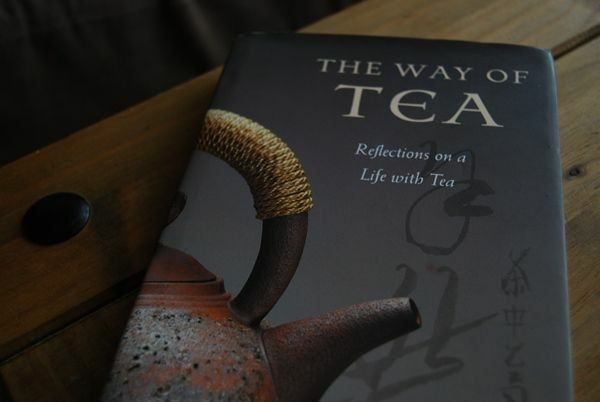 In fact, my opinion is entirely moot - consider the book to be a larger version of the magazine, focussed on the Dao of tea, and you'll have a very accurate estimate of how well you'll enjoy the longer material. 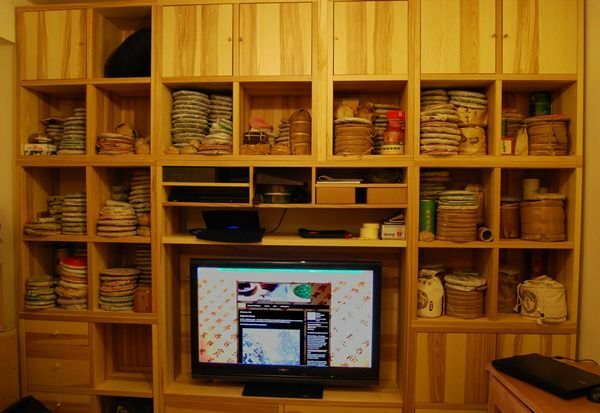 Though we've been living in our house for some time, the renovations have taken ages. 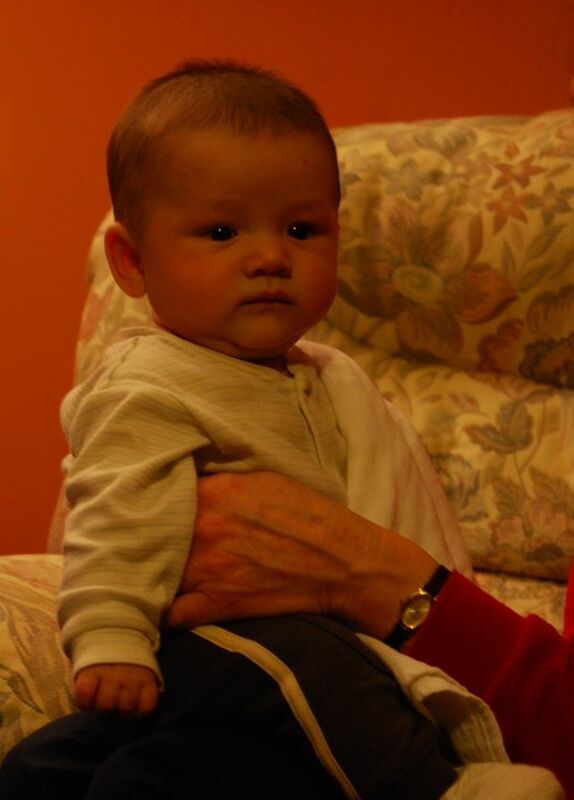 Dear Xiaohu has coped very well with the chaos into which he was born, and it is only now beginning to look like a home. Teachums who have visited since we've been here (Nada, Apache, Mr. Finland) have been very patient with our humble surroundings. This means that all of the tea that I bought last year has been living in my office, largely untouched. Just a few days ago, I hauled a whopping great big box of tongs from Essence of Tea all the way from my office back to the house - by bike. It was wobbly. Today, I brought back a box contained the tong of 2001 Dingxing that I'd ordered from 999 Wo Xin Yijiu (via Taobao), a tong of 2006 Xingshunxiang (from Chanyi Chaju, via Taobao), a pile of 2006 Douji (from Dragon Teahouse), and a number of 2004 Xingshunxiang cakes (from Gongma Qijian Dian, via Taobao). As I unpacked them at home, I realised the connection between the all: His Grace, Dr. the Duke of N*. *I love the fact that Debrett's even covers how one should address a Duke with a doctorate. 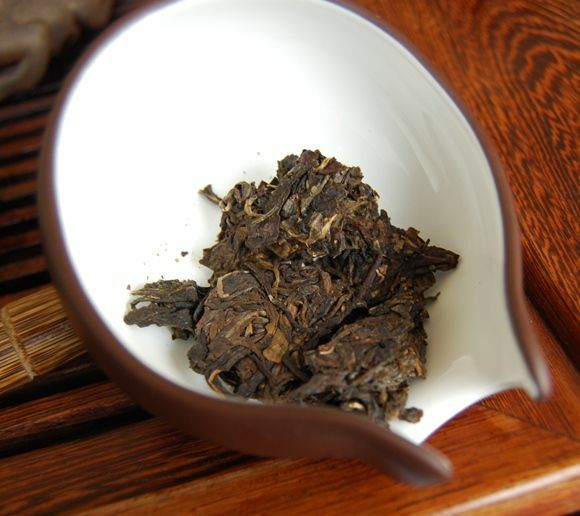 The 2001 Dingxing* and 2004 Xingshunxiang were Taobao recommendations; the 2006 Xingshunxiang was a cheap-and-cheerful purchase from Shanghai; the 2006 Douji was a recommendation from Malidandao. So, thanks indeed, your grace. You may recall that the vendor of the 2001 Dingxing was... of an uncertain reputation. I'd received some warnings via e-mail, in fact, from teachums based in Hong Kong. Being something of a gambler, I trialled first a cake, then a tong, and all turned out well. 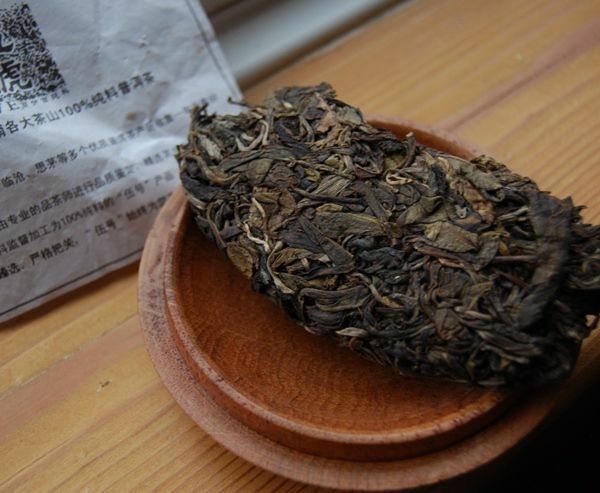 Not only that, but the vendor ("999 My Heart Will Always Go On") even included a large bag of very decent maocha, and this 2006 Xiaguan tuocha. 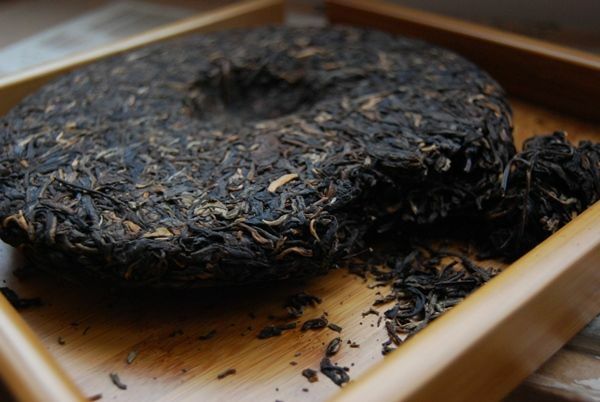 *Well done to Tea Goober for finding this cake now for sale at Puerh Shop, at a reasonable price, and bravo to Jim for stocking it. This is a "Big G" production, which is a decent grade, lying beneath the generally better "FT" items from Xiaguan. 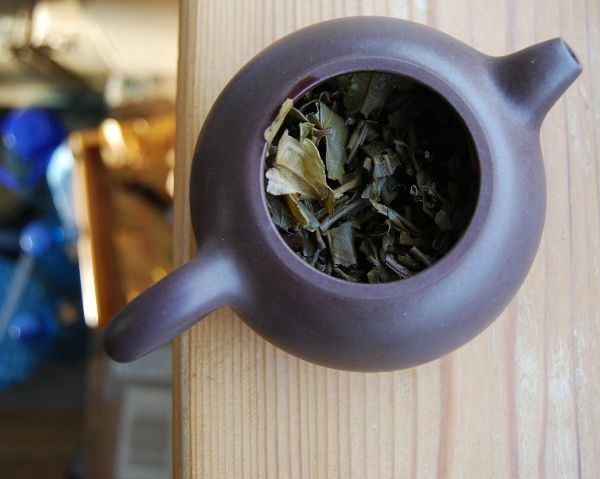 It looks just like you'd hope, from Xiaguan - little leaves, nicely presented, minimal breakage. The compression is loose enough to access, tight enough to age. Xiaguan is based in Dali, a northern city, with a famous lake (although now infamous, due to its pollution). 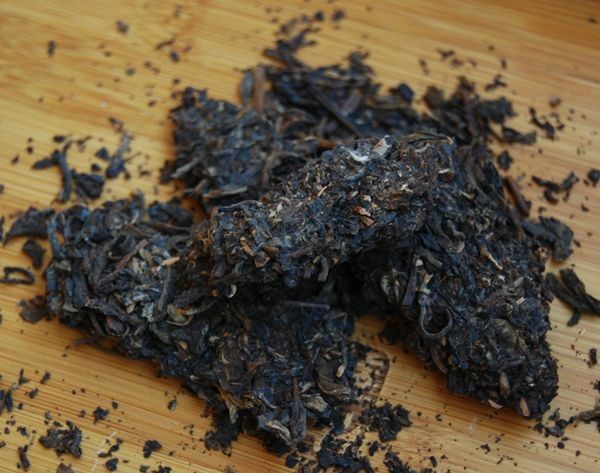 The leaves from up there have a distinctive character - even without the "blackening" of modern Xiaguan productions, there is a constant, easily-recognisable trait that runs through their products. I like it very much, and am always delighted to try new, good Xiaguan - although I've got enough of the "black" stuff (Baoyan, Duling Fengsao, Hongloumeng, etc.). I don't remember where, but I tried some non-Xiaguan Dali leaves in another production - they tasted very similar. I can recall the flavour clearly, even though I can't recall where it was that I tried it. Taste-memory is a curious thing. This is a lovely, clean Xiaguan. It is sweet, grainy, and very, very long. It really does go on forever. It doesn't crack, but rather swells as the infusion goes on. In fact, it behaves rather like a high-grade tea. Good old Xiaguan - despite their interesting, occasionally bizarre, experiments into processing, I give them plenty of leeway to do so in my affections, because you know, at the end of it all, that they are tea gurus. They have some mighty blenders at work in that place. The room is filled with good, fresh Xiaguan, and I am a happy man. 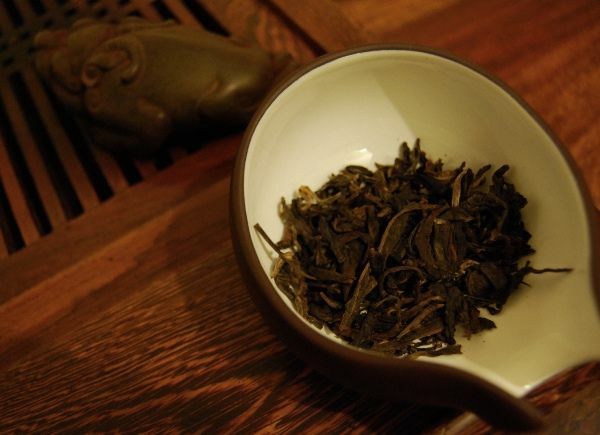 Hats off to "999 Wo Xin Yijiu" for providing some delicious, thoroughly-appreciated, tuocha. Shown above, the new pu'ercha bags from Dragon Teahouse - rather pretty, don't you think? Gordon has an eye for aesthetics that complements his very decent range. Why all the Changtai? No reason other than the fact that they bubbled to the top of consciousness, and that Kenny so kindly provided a bunch of samples. I've previously encountered the "zhengpin" and "jingpin" (4th and 3rd grades, respectively) of this 2009 Banzhang recipe, and, while the opportunity to examine the effect of the different Changtai grades while keeping mountain/year constant has been excellent, the lower two grades of this cake weren't very impressive. Herr Dr. Kim: "We bought some 2009 Banzhang - have you tried it?" Me: "Ung? Ook? Did we?" I dug into my spreadsheet and, lo, it seems I have one cake of this, and paid 45 euro for it. On subsequent digging through my stacks, I discovered the above. To my delight, it seems to be the "zhenpin" (2nd grade) of the very same recipe that I've been tasting. If the zhengpin (4th grade) was pure plantation with a wisp of Banzhang, and the jingpin (3rd grade) opened well, but then collapsed into sour plantation, how about this 2nd grade cake? I am reassured from the start. The tiny, bush leaves of the lower grades have been replaced with fragments of much larger leaves, each of which is furry with down. It has a gentle, tobacco-sweet aroma that was almost absent from its lesser cousins. It looks much more "boutique" than its "mass production" relatives. Dropping the dry leaves into the dark, warm, damp depths of the rinsed pot releases a welcome plummy scent. Suddenly, it seems as if everything is going to work out well, after all. The soup, as you may see below, is yellow-orange, and has mixed scents of sweet grain and leather. Decent flavours of the same, with some bitterness, fill out the finish. 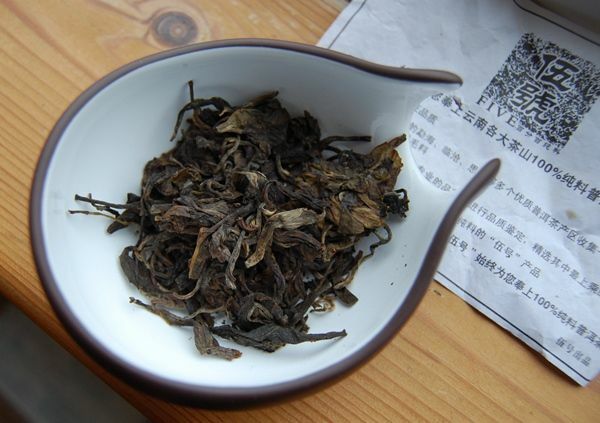 It cannot escape being blended with more aggressive plantation leaves - this is just a standard-label Changtai, after all - and their sour, green / brown character may be detected. However, they are much diminished compared with the plantation contribution of the lower grades. Pleasant tobacco scents are left in the nose, and I even detect a slight cooling sensation on the tongue. Drinkable, this is probably the lowest acceptable (or even tolerable) quality version of this cake, and, even then, I cannot imagine buying more. 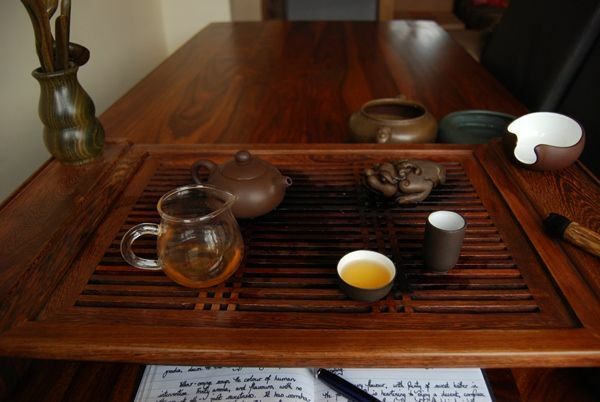 For the first time in quite a few days, I have a very enjoyable tea session. 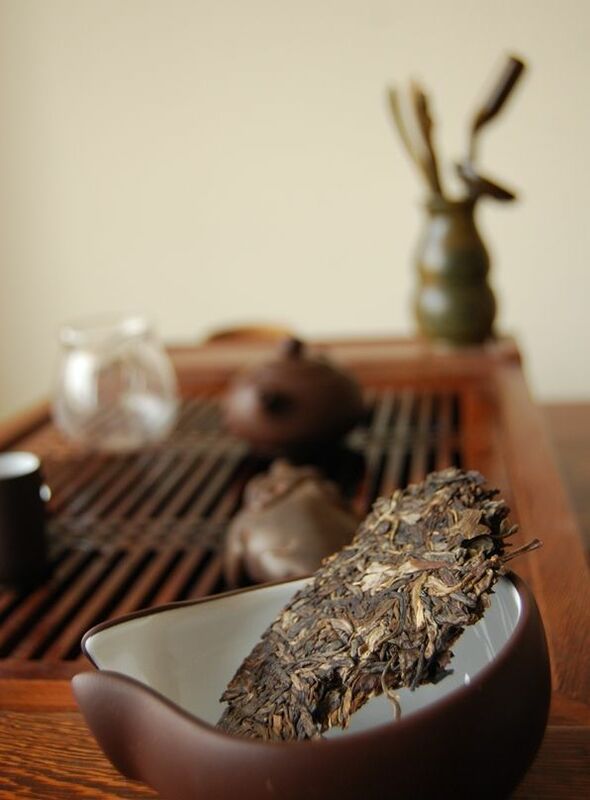 In later infusions, the Banzhang character remains detectable, while the plantation contributions do not come to dominate. It is a mainstream cake, but there is something of Banzhang in it. I reflect on how much I compare these cakes to the few samples of pure, old-tree Banzhang with which I have been fortunate enough to be provided by generous tea-chums (notably, a 2008 Laobanzhang and 2008 Xinbanzhang, thanks to Nada). 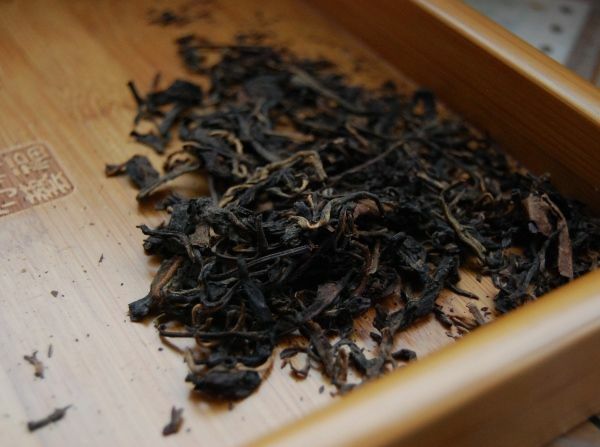 Those actual laoshu samples show that Banzhang is sweet, slightly grain-like, slightly leathery, but, above all, clean and pure. It has been a long time since I tried them, but they still remain clearly in my "taste" memory, and provide a valuable comparison for later cakes. If you can find some good samples, I would recommend chasing them - even if they cost quite a bit (as they will for Banzhang, no doubt), I am of the mind that it would be worth the outlay. It's entirely possible to extrapolate what general Banzhang might taste like, from trying lots of lesser-quality "Lao Banzhang" cakes - the common thread between them all is, in all likelihood, two things: Banzhang, and plantation. If you have a handle on what bushes tend to taste like, then you should be able to form a good idea of actual Banzhang. The rinse looks a little brown, as if a touch aged. The scent is surprisingly pleasant and long-lasting. Its flavour is now dark, quite smooth, and cooling. 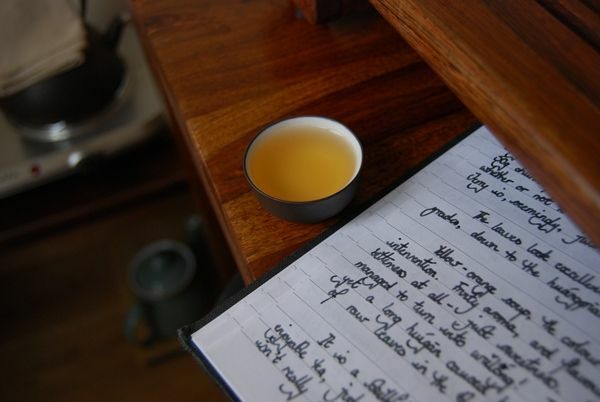 Five years of aging works wonders on strong, basic tea. The resulting sweet, woody character is most enjoyable - this is an encouraging outcome. What say you to my new piece of essential chadao? It brings the gurgles, hiccups, and (yes) snores of my dear son to the tea-table, so that I can keep an eye on him, or even an ear on him, as he sleeps while I'm drinking. Thankfully, the system requires me to push a button in order for him to hear me. This is an advantage when I am screaming in agony after drinking harsh plantation tea. Such as today's Banzhang, from Changtai. It's their bottom-of-the-ladder production, "zhengpin", which is one grade below their "jingpin" that I wrote about recently. 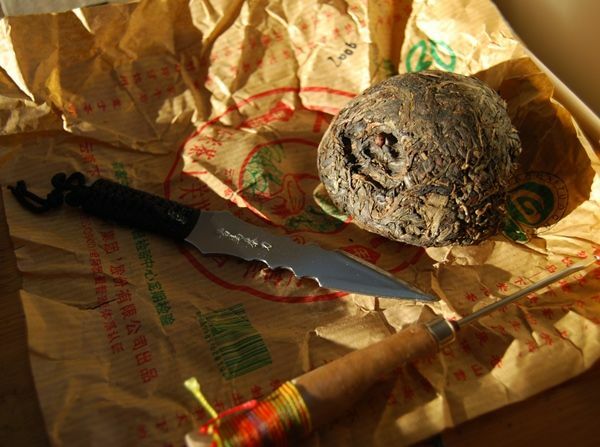 The higher-grade jingpin opened with a very lovely introduction of actual Banzhang, before fading into plantation grimness. This cake skips the introduction and gets straight to the plantation. You know that I love Changtai. This is one of the first times in memory that I can remember actually disliking one of their cakes. It has almost nothing to commend it, being a slog of plantation green-brown characteristics from beginning to end. The soup is a solid orange, which justifies my raised eyebrows at the red leaves in the blend. 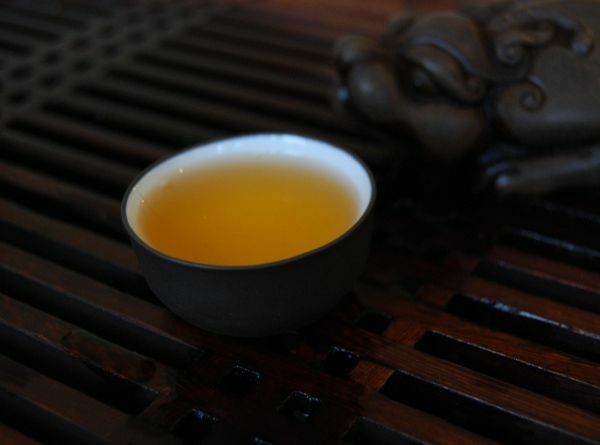 There are the barest hints of Banzhang, with its hints of clean, sweet leather, but I get the impression that this tea session is simply man vs. bush. It's a genuine education to compare the various grades of Changtai, keeping the region and the year the same - thanks to Kenny for providing this sample, as he so kindly did with the "jingpin" version. 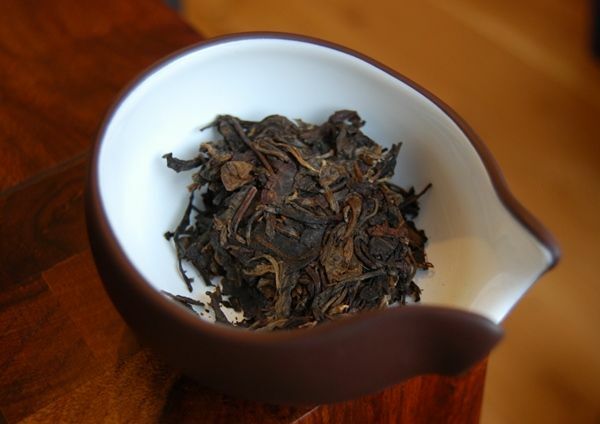 This "Golden Bamboo Mountain" recipe is one of my favourites, and I have previously written concerning the 2005 version (thanks to Keng), the 2006 version (thanks to Gordon of Dragon Teahouse), and the 2009 version (thanks to Jongky of Red Lantern). This is the eldest incarnation of this recipe that I have seen, and so I am very thankful to Kenny for the opportunity to try it. 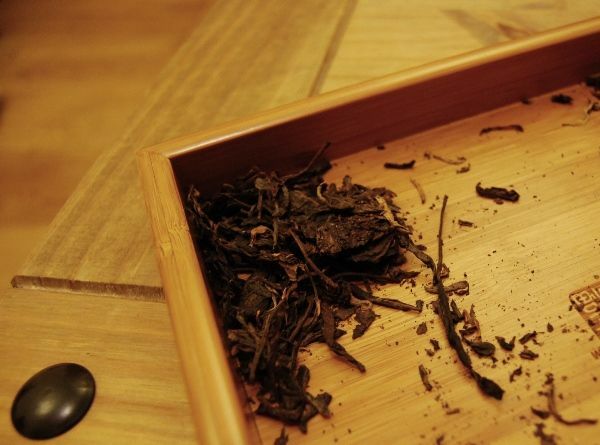 He notes that it is dry-stored: the leaves have a distinctly humid aroma to them, and I am reminded of the potency of his native Hong Kong climate. Large leaves, with plenty of furry tips, fill me with glee. It has a charming aroma of real maturity, and I am delighted to see how this familiar recipe fills out with age. It is clean, with a lovely sweet, cereal aroma, and its "golden bamboo" characteristics have swollen into a fine, woody maturity. As good on the tongue as always, it brings plenty of water to the mouth thanks to its sharpness - this is a good thing. It isn't a heavy, viscous tea, but then again, it's not an excessively expensive tea, and I think it's great value for its fairly modest price. It's quite one thing to try an old favourite recipe, and another to get some insight into the aging process acting upon a recipe that has, by and large, remained stable over the years. 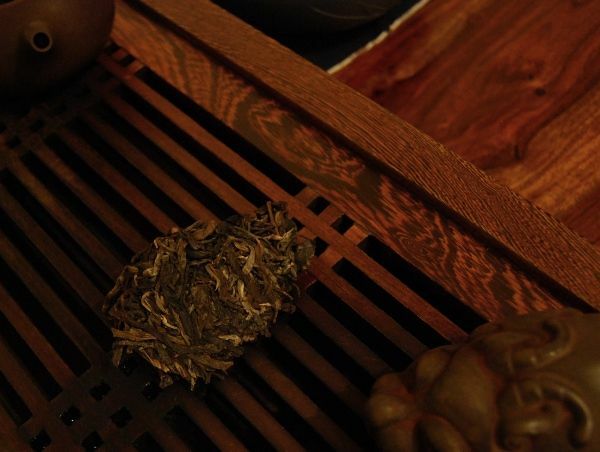 Even in this elder variety, there are a small proportion of reddened leaves in the blend, added for complexity. Perhaps this will cause it to sacrifice some body when it's fifty years old, but it's not an excessive amount. The result is a very decent recipe for aging, at a fairly healthy price. Thanks again to Kenny for the sample. Simao diqu is a favourite. Despite years in plastic, this sample still has the gentle scent of humidity - it is the last half of a package kindly provided by Kenny of HK. 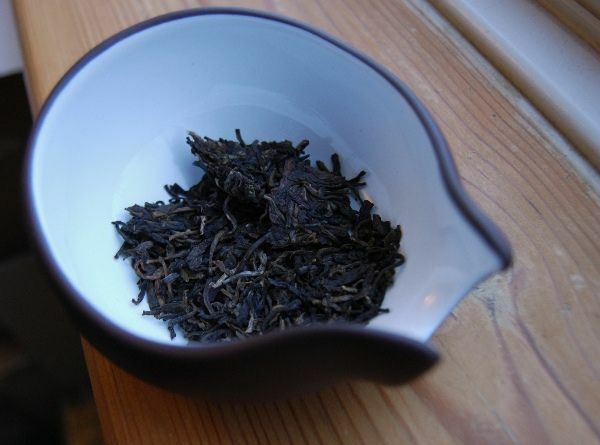 Malty, sweet, cooling: this is an excellent tea, which leaves the mouth watering. The colour is an orange-red, as would be expected for its age. 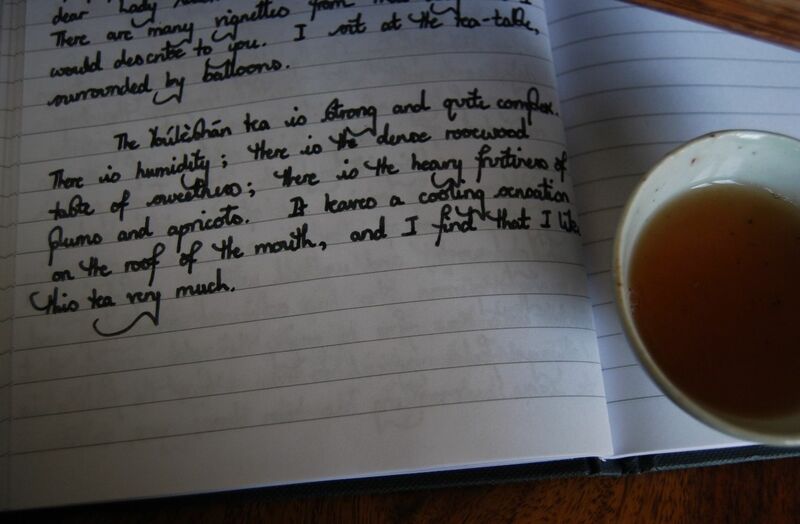 "Worth drinking slowly, and appreciating fully", my journal has. Thick and malty, it is easy to enjoy. Here's a bit of fun, kindly provided by Jerry of China Chadao, which I believe he is considering stocking. Wuhao means "Number five brand", and that's all I know of it! Jerry mentioned that it was created by a small producer. The leaves look excellent - they certainly have the appearance of being a small production run, being large, loose, and well-blended. It has all grades, from tips to huangpian [yellow flakes]. Noting that this is a very new cake, the orange-yellow soup is the colour of human intervention. Sure enough, this tea is truly, massively, exceptionally fruity, with no bitterness present whatsoever. It has tons of sweetness, that lasts long in the mouth. This is archetypical "gift tea" - it's the kind of tea that is very high quality, and very accessible, which you'd give to someone as a gift, which you can be sure they'd enjoy. Among my friends, almost all dislike pu'ercha, among those few that have tried it. This would make an ideal cake for them. They could have all the fun of drinking pu'ercha, without the need to actually drink it. I believe the price was nice and low (RMB 100ish? ), which is entirely appropriate for something like this. It won't age, but I get the impression that it's not intended to do so. 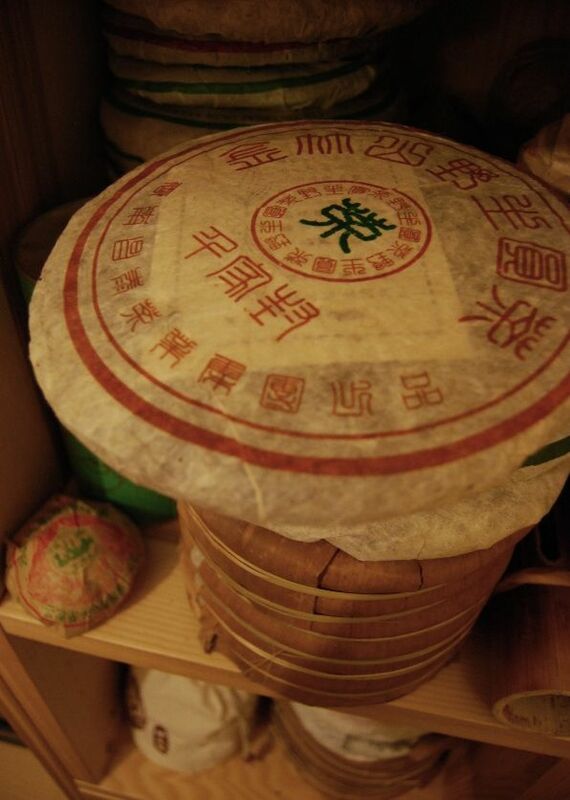 Thanks to Kenny of Hong Kong for this sample of a recent Changtai cake, graded "jingpin" on their Changtai scale. I am fairly sure that "jipin" is their topmost grade, while "zhengpin" is their lowest, with "jingpin" and "zhenpin" fitting in between. It's also, I believe, the first Banzhang cake I've tried from Changtai (which is, as you will have no doubt gathered, one of my reliable "go to" producers). This cake does not tell a straight-forward story. It's a story that begins well - the leaves look excellent, as you can see pictured above. We have large leaves, well-handled, with a goodly mixture of tips and heavier leaves. Perhaps less obvious in the above image is the fact that there are some undeniably red leaves in the blend, which Changtai rely on more and more in their recent cakes (say, post 2005), particularly in their non-premium cakes, such as this. The leaves separate well, and the lightly-orange soup gives off some particularly beefy, complex scents that raise my hopes and get me hoping for the best. There is plenty of sweet, grainy leather in the aroma cup, which has a remarkably long duration. It is the very best kind of opening. 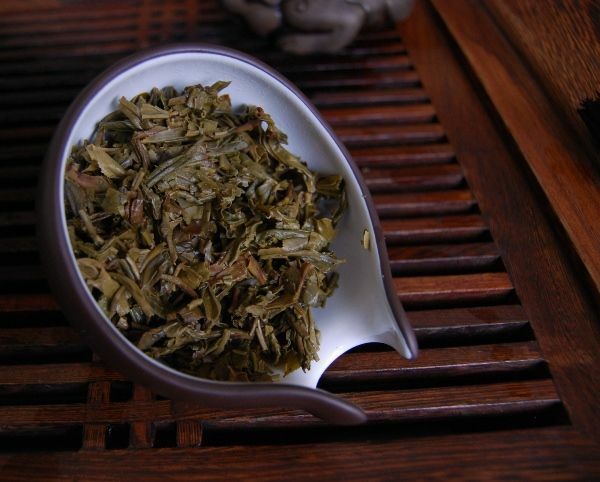 The first infusion is likewise - a fine, savoury flavour that reminds me of actual Banzhang leaves, with a long, sweet finish. It even has a charming bouquet that lingers in the nose. Had I finished there, I would have been thoroughly impressed. Unfortunately for both me and the tea, I went on - subsequent infusions see this contribution from presumably real Banzhang leaves swamped by the muddy, sour roughness of plantation leaves. The remainder of the session turned into a man vs. plantation battle, and the contribution due to the good Banzhang leaves never returned. The sweet, charming notes from good leaves are in there, and they speak up first, but then are rapidly drowned out by the gravelling, angry barking of the rough old plantation leaves. It reminds me of a clarinet playing in a thrash metal band. 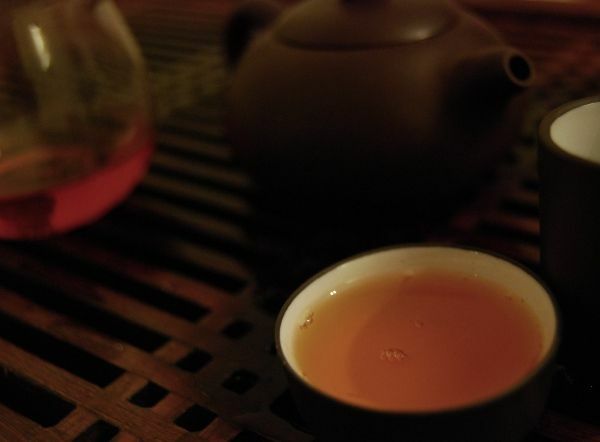 Perhaps Changtai shouldn't try and jump on the Banzhang wagon - they have plenty of good, stable recipes from mountains where the good leaves are affordable, and their results wih teas from other places (Yiwu, Jinzhushan in Simao, Yibang, Manhzhi) can be much more reliable. Thanks again to Kenny for the opportunity to try something different from one of my favourite brands. i. Sell old pu'ercha, "vintage" pots, and wulong, with a limited selection of younger shengpu, typically via a nostalgic-styled web-site. ii. Sell cheap-and-cheerful, typically via eBay. Most vendors come down on either side of that distinction. The first is typically motivated by selling "rare" goods (actual value unquantifiable, large profit margins), while the latter is typically motivated by selling cheaply and in large volumes. The first method is easier - pick up some suitably "rare" goods from your last holiday in the orient, knock up a web-site that conveys a suitable impression of vintage quality, and hike up the prices. The latter is hard - it is the cut-throat world of small margins and large distribution. Yuechen Yuexiang - "Will improve with age". An unproven sentiment. While most vendors in (i) benefit from the opacity of their product's pricing and debatable market value, there isn't anything innately wrong with buying cheaply and selling high - it is the basis of commerce. 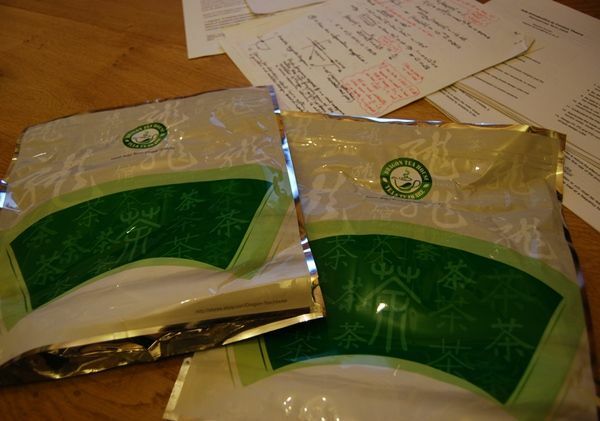 Most pu'er drinkers are no strangers to a bit of sport concerning price gouging - we've happily been buying Taiwanese bingcha from Houde for years. However, there is an insidious sub-class in type (i) vendors that actively tries to capitalise on consumer ignorance. The formula for this sub-class is to hunt for accessible cakes from rock-bottom labels (modern CNNP, Haiwan, and their ilk), pick a small selection of around a half-dozen cakes (to suggest careful selection), pop them up on a web-site with plenty of white space, then turn up the prices above maximum and sell to the hopefully-ignorant public. For special effect, utilise plenty of vocabulary from the wine- and cigar-tasting spheres ("premier cru", "vintage", etc. 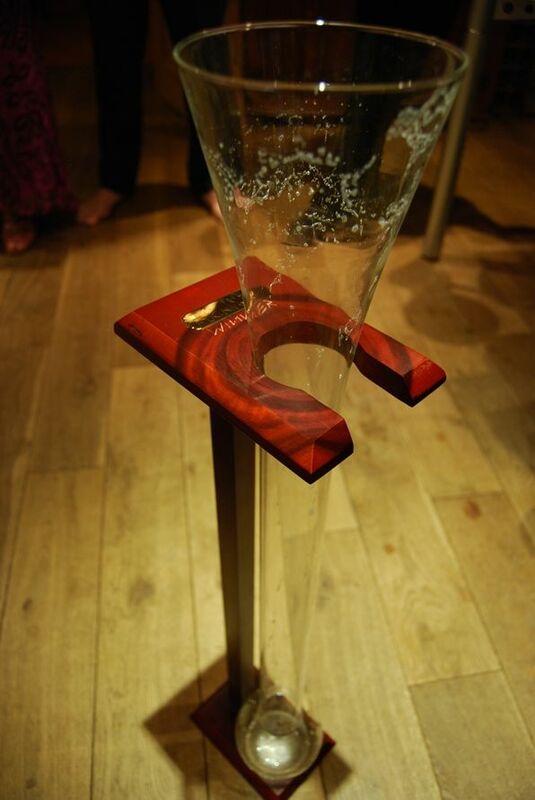 ), to reinforce the illusion of quality. Such practices are a time-honoured tradition, particularly amongst England's mercantile classes. Prices here are astronomical, for most things. Trainers [sneakers] sold in England are often 200% the price of their equivalents elsewhere; music CDs (remember them?) when bought in shops were typically extortionately priced; wine almost doubles in value the moment it crosses the Channel from France to Blighty. The Economist recently ran an amusing piece on the "expensive, tiny" houses of England. I was reminded of a long-time friend who, upon emigrating to California (the poor fool), bought a vast house with the money made from selling his tiny city property in England. My little brother tried the same trick, but he soon came back to our humble university after failing to negotiate eight-lane highways of Californian traffic on his bicycle. Tea shops are no different. Indeed, they have the advantage that most English people know tea that can be an item of wonderful quality (it seems to form part of a long-neglected folk memory in our collective unconscious), and yet almost no-one knows any better than the dreary muck available from Whittards of Chelsea. Witness the success of Jing of London (not to be confused with the eternally-excellent Jing Teashop), which I recently bemoaned in a piece on - quelle surprise - modern CNNP sold at eye-watering prices. So, then, to a new outfit, named Canton Tea Company. 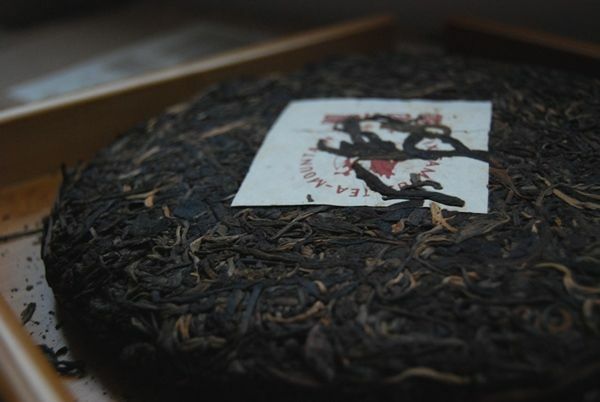 Tears well up in my eyes as we see that the 2004 Jixing "Yiwu" (no mention of CNNP) appears at the bottom of the list, weighing in at £78 ($121). I dare you to have a quick Taobao search for cakes from the Jixing factory. (Type "Jixing" into the mighty Babelcarp, then copy the resulting characters into Taobao.) This is a factory whose products are, as anticipated, rock-bottom in price, seldom reaching above 200 RMB (£19), even for cakes with some age on the clock. Contemplating the pretty sample packet at my tea-table, kindly provided by Edgar of Canton Tea, my mind is filled with the above prior assumptions, which are not complimentary. 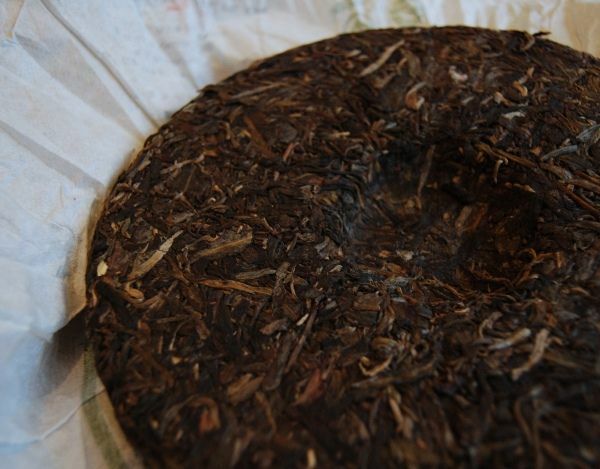 The cake is made from smaller leaves, and has a dark, pungent aroma that reminds of modern Xiaguan. 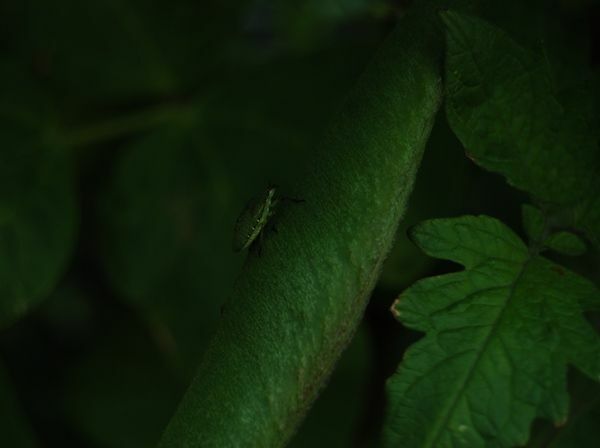 The presence of reddened, processed leaves confirms my suspicions, and further strengthens my unkind assumptions. I like to think I'm not entirely close-minded, however. The tea itself surprises me - it is really very enjoyable. Delicious, in fact. You will love or loathe this cake depending on your attitude to modern Xiaguan "special" productions. I love them, because they are as dark, blackened, and husky as the contents of my withered soul. They are stuffed full of faux-tobacco flavours and scents that bring to mind my father's pipe, and all the vicarious enjoyment that comes along with sniffing the smoke of a pipe-smoker, without being brave enough to smoke it yourself. This is so much like processed Xiaguan that I would categorise this as more than an "homage" - it is, in fact, a direct copy. 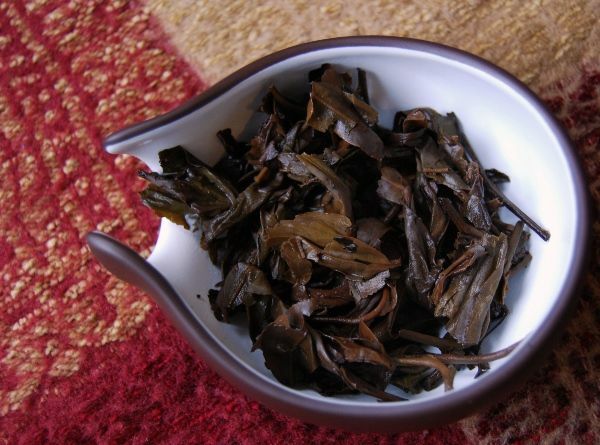 It has the blackened heart of Baoyan, but retains the cereal, grain-like charm of that Xiaguan area's unprocessed, raw leaves. It is absolutely akin to the 2008 Xiaguan "Duling Fengsao", released under their premium FT label. For £78, one would hope for single-mountain charm, carefully aged for a few years, probably from some highly-reputed producer. To charge £78 for something as immensely, almost overpoweringly, processed such as this cake... well, my dear wife described it as "criminal". 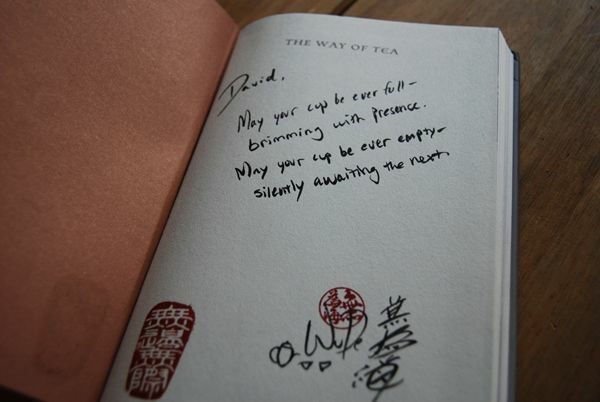 Presumably, as with Jing of London, such teas are not aimed at you and me, but at the Whittards crowd. The danger is - when people know better, they'll buy elsewhere - hence the dependence on consumer ignorance. It's like the export wine market in the 1980s. I should add, however, that Canton Tea also provided us with an entirely wonderful lapsang souchong, which is precisely everything I have been looking for, if you recall my old article on my quest for such a tea. 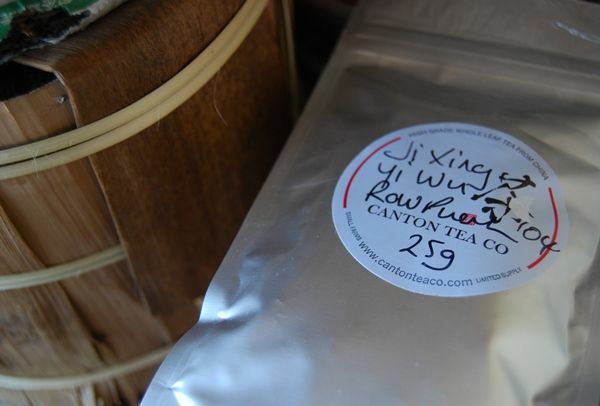 The price is shocking for the Canton Tea lapsang, too, but I think it's worth it. Thanks again to Edgar for two fascinating samples. Class (i) vendors are wide and varied - anyone who isn't selling in high volume, but who focusses on quality, falls in this category. "Boutique" vs. "quality". There will always be disagreements in price, of course, given that everyone has a different budget. The subject of Houde's perceived high prices in some categories is well-documented, and I mentioned it here as a reference to previous discussions had around the on-line "tea-sphere". Hence, I don't find it at all unfair to cite Houde as being highly-priced - we buy from Houde because we prefer the quality that comes with the high prices, as I mentioned. You know, I have spent more money at Houde than I care to recall, and will continue to do so because I (i) like Dr. Lee's tea, and (ii) like Dr. Lee. I have to be honest and say that I don't like his prices - it's not unreasonable to do so, I believe. I prefer direct criticism rather than sideways implication, and hence you can always rely on the grumpy fool at the Half-Dipper to tell you his opinion. I like to think that I've arrived at my conclusions through reason, though, and am happy to back them up with a good discussion. In the same section, I described charging high prices as being entirely acceptable - it is the basis of commerce. Tea used to cost more than gold, at one point, and was bought with glee. If one doesn't like the higher prices, then one looks elsewhere. The purpose of this article is that I believe that there is a sub-set of normal vendors who actually require consumer ignorance in order for their business models to function. I described how, in my opinion, certain vendors have such requirements in order for them to operate as businesses successfully, and then described how they arise naturally from cultural expectations of pricing in England. The pricing may not be opaque to those from Malaysia, Singapore, and Hong Kong, given their proximity to the market, but it is entirely opaque to Westerners, whom, I suspect, form the major market for such vendors. Opacity is a simple product of geography - we've been importing opaquely-priced goods for centuries. I believe it entirely fair to say that vendors in this class benefit from such opacity - it is a logical and indisputable fact. I have tried to look up the prices of so, so many products that I've bought from "boutique" vendors, and fail to do so 90% of the time. Such opacity is merely a function of the items being sold, and hence, I believe, my point is entirely fair. I'm happy to support it with further debate! My comments refer to the oft-played-out battle between "boutique" and "high volume". The latter, with their paper-thin profit margins, are particularly hard to make work due to their requirements of scale. The former enjoys higher profit margins, by definition, and is therefore afforded more flexibility in marketing. Whether or not either could be made to work as a source of primary income without difficulty isn't under discussion. I'm sure both require effort. [What purpose does your post serve? I rather like reading candid posts about people's opinions. If someone buys an overpriced kitchen, it gets installed badly, and then they have to sue to get it corrected, I would like to know about it if I were buying a kitchen. (I've been doing this recently, and benefitting from candid assessments.) The "free press" is a time-honoured method of enforcing honesty on our societies, through critical writing. It has to be fair writing, but I would stand by my assertions as being both reasonable and based on personal evidence. If you don't agree, I'm happy to continue this well-argued debate. Who would find it useful? The Half-Dipper is fortunate enough to attract a rather large quantity of readers from the more casual end of the spectrum, and I've had some good e-mails on the subject from a couple of new-comers who experienced similar frustrations when dealing with the sub-class of "boutique" vendors that is the subject of the article. They found it useful. Looking further afield, it's also useful for tea companies. Bizarrely enough (and I have no idea why such a thing would occur), I've given advice to over half-a-dozen start-ups over the past few years, and the text of this article came from my correspondences with them. The found it useful, apparently. Most of all, I'm writing for my dear Half-Dipper readers, who are people just like me. We support both types of vendors, and we love nothing more than to share opinions, information, and gripes in order to get us to our goal: good tea. Thus, the article is simply one man's assessment of a market, how one would progress within it were one of the mind to do so, and a critique (and warning) of those whom I believe have got it entirely wrong. 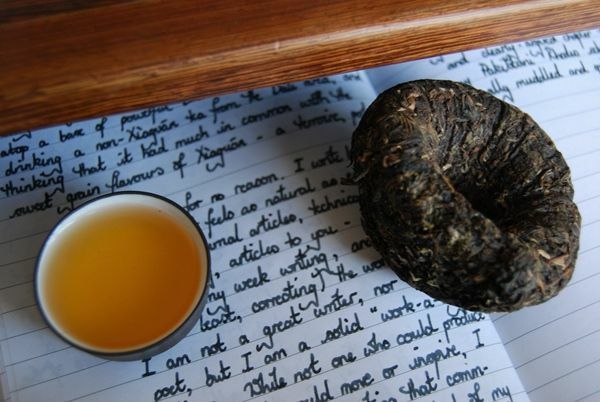 It's all very well writing about tea, but what if we're looking to buy something immediately? What's available and decent? 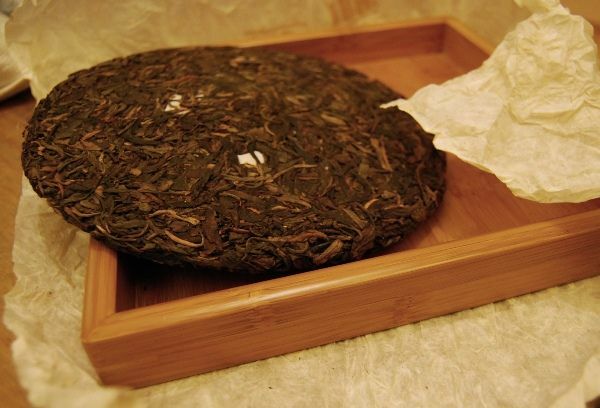 If we're not delving into Taobao, and assuming that we've all tried and enjoyed some of the Essence of Tea 2010 cakes, then my currently-available picks really come down to two web-sites. At China Chadao, I like the full range of Douji cakes. Jerry seems to stock the entire ranges from 2009 and 2010; while I haven't tried the latter, I did thoroughly enjoy the former. 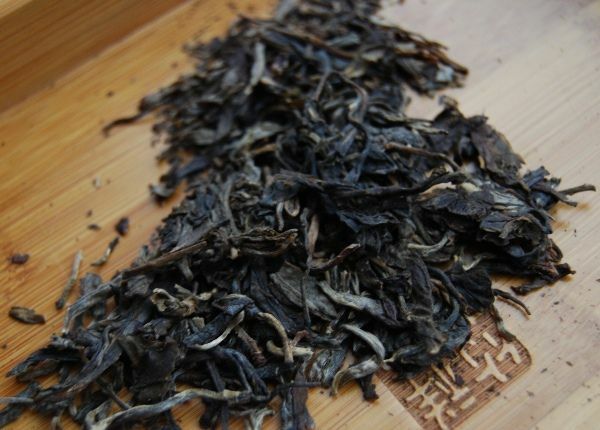 Douji are always stable, very good examples of their various single-mountain sources, and China Chadao price them very attractively. If I were looking for a few tong of good recent tea, then I'd be looking into this Douji range. The Zhimingdu range is a cheap-and-cheerful version, offering another good introduction to each mountain (particularly the series of single-mountain mini-cakes). My other choice is Red Lantern Tea, where I particularly like Jongky's selection of Changtai cakes. These stretch back to the earlier half of the 2000s, and you can pick up some excellent older cakes for just a tad more than the current range of 2010s. If I were looking for a few tong of something with a little age on it, then I'd be looking into the Changtai back-catalogue here. While standard Changtai cakes may not be too exciting, the "premium" brands from this factory are excellent. One or two readers traditionally disagree with me on this point, but I usually find Yichanghao cakes, for exanple, to be highly reliable and not expensive. Today's cake is from their "other" premium brand, Qianjiafeng [chee'an jee'ah fung]. 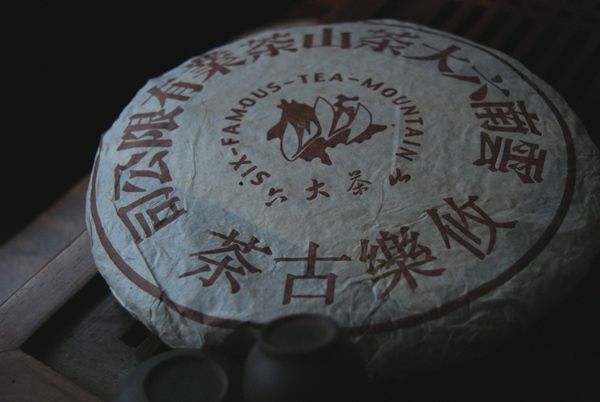 The mighty Babelcarp (which appears to be sporting a dashing new look) recently taught me that the name of this brand refers to Qianjia Village, on Jinzhushan [jin djoo shan, or Golden Bamboo Mountain], where a supposed 2,700-year-old tea-tree resides. 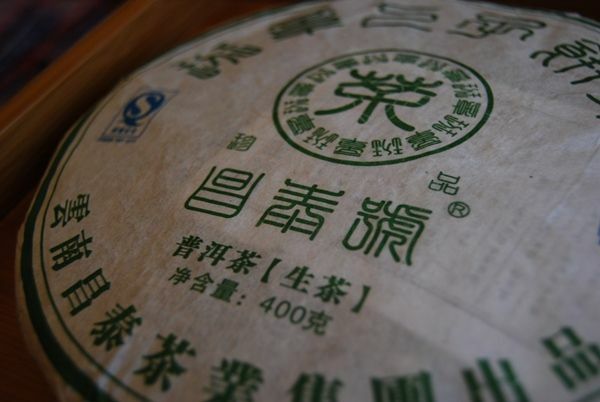 Thus, it is unsurprising that the Qianjiafeng brand seems entirely focussed on the "Jinzhushan" recipe. I've previously tried the 2009 version, thanks to the generosity of Jongky at Red Lantern, and the 2006 version, thanks to Gordon at Dragon Teahouse. This 2005 version comes thanks to the generosity of Keng. 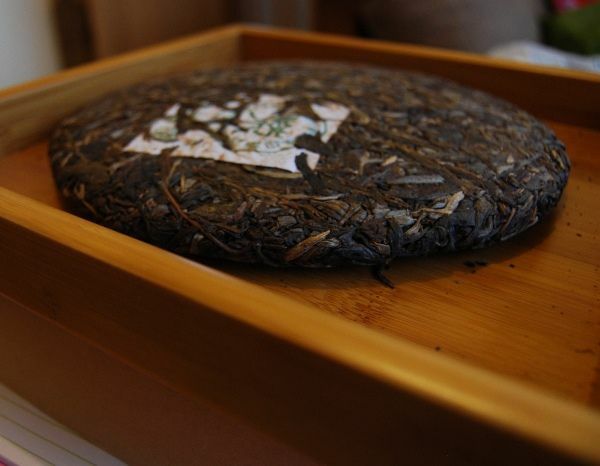 As with most good Changtai cakes, this is made from almost-whole leaves, from aged, coppery tips to time-darkened basis leaves. I remember that the modern versions of this recipe contains a minority of reddened, processed leaves, presumably to add character - this older version doesn't seem to contain many processed leaves, if any at all, and looks entirely proper. 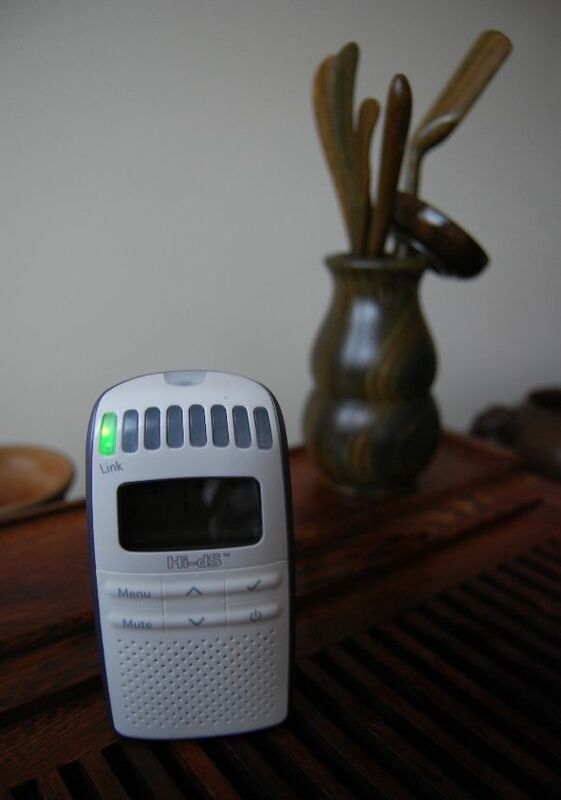 Forgive the photography - I found myself up at 4 a.m. (half an hour before Xiaohu awoke, calling for milk! ), and so the light is artificial. Pre-dawn drinking has a long-standing place in my affections, and I love to sit downstairs at my tea-table in the near-darkness, while the wind howls down the chimney, and the first birds begin to rise. 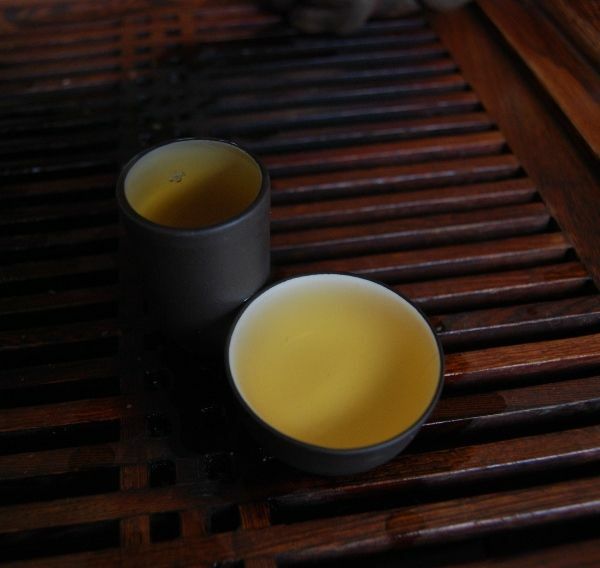 "Golden Bamboo" is a fitting name for this charming Simao-region tea: in flavour, it has a yellow, straw-like woodiness. It is wonderfully astringent and draws plenty of water into the mouth, long after the swallow. I brew it hard, and it responds well. I often think well of teas that take a few infusions to pick up steam - this cake is very quiet in aroma during the rinse and first infusion, and really only opens up in the second infusion. I often associate this with teas of a certain power, that can be expected to brew a large number of infusions, and last well during the course of the years. Good Changtai cakes age very nicely, and I often revisit my old favourites from this familiar producer. 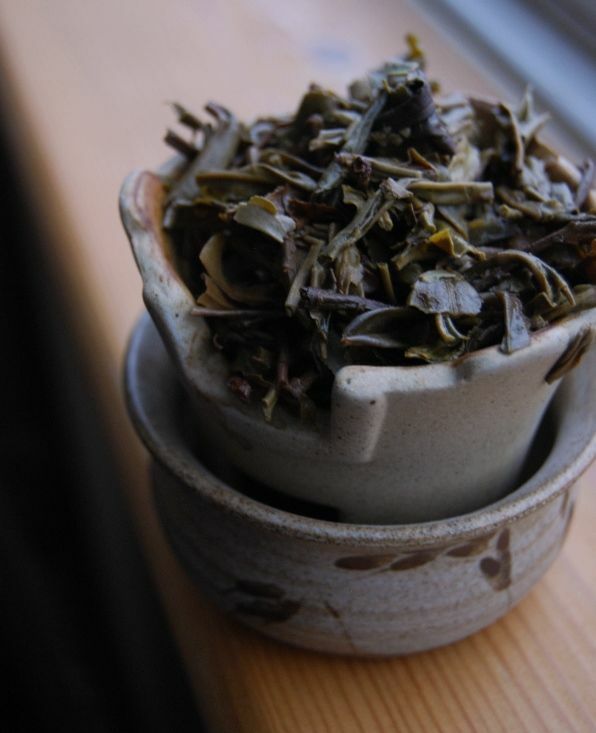 Warming, well-constructed, and entirely charming, this tea is thoroughly worthwhile. Red Lantern prices it very well, where it is just a little more expensive than the price at which Keng can obtain it from his local Singaporean vendor, and so I can heartily recommend it - particularly for those who, like me, are partial to a bit of the ol' Changtai, and are after something with a few years on the clock for a good price. There are several people whom I've encountered that are genuinely kind individuals. Among them is my wife's sister, who is visiting us from China, and who helps to look after Xiaohu. Her generosity of spirit consistently amazes me; when she came back to the family home at Christmas, my family were likewise glowing in their praise of her kindness. Another truly generous person is Keng, a teachum from Singapore. He has sent Lei and me box after box of carefully-packaged and selected cakes that he has bought from his (apparently superbly stocked) local pu'ercha vendor, with nothing more than a desire to share tea and to talk about cakes. The sheer quantity of tea, ranging from 1995 to 2007, and the care with which it is picked, is entirely flabbergasting. I'm often quite hard on 6FTM, because, like modern CNNP, they seem to have produced very low-quality, mainstream cakes over the past few years. However, something at 6FTM has definitely changed, because their earlier output is as different from their recent cakes as night from day. Note above, the traditional-style wrapper, with large characters surrounding the factory logo. 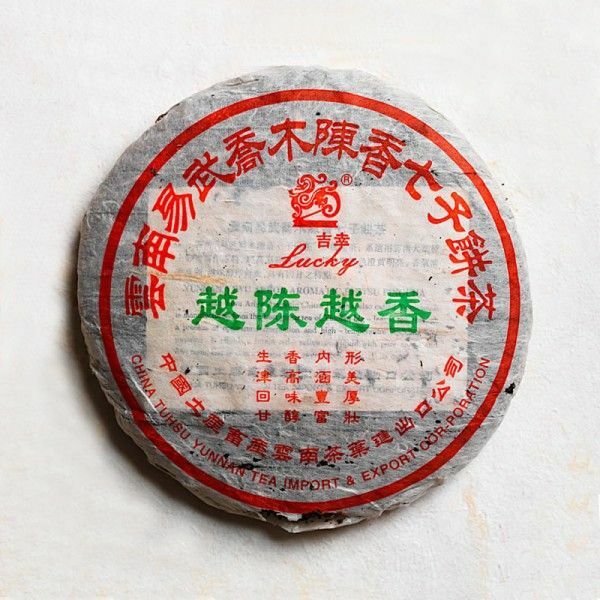 It is rustic, simple, and informed by the conventional "zhongcha" wrapper style. This cake was made before 6FTM shifted their focus into a more "modern" approach, which happened somewhere in the interval of 2004 - 2006. Pictured above and below, the large, delicious leaves of the cake couldn't be more different from today's androgynous, chopped melange. While chopped leaves feature regularly in older cakes from other producers, 6FTM used to make big-leaf cakes like this. Keng has kindly provided several examples of the genre, but this Youle is one of the most striking. 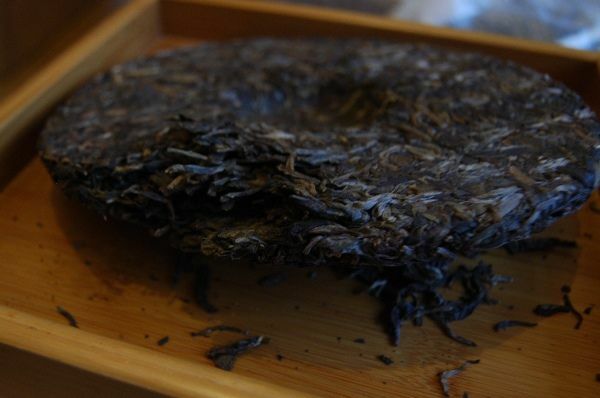 The cake is an excellent blend of good shengpu leaves, properly aged into a rich, darker brown, with some copper-tinted tips. 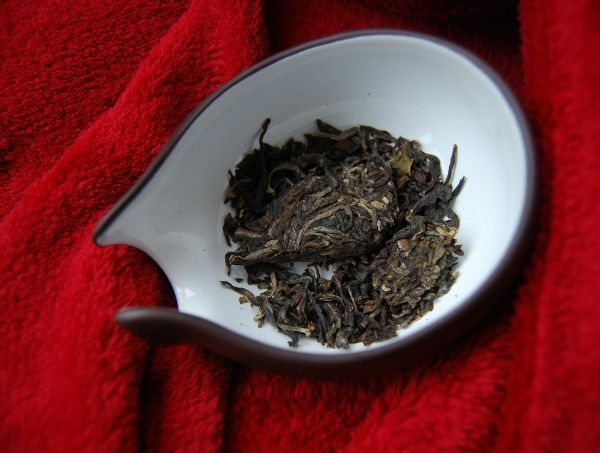 There are a few heavier leaves mixed in, which is something that I consider to be an advantage: an eclectic blend of leaves from tips to base can make for an interesting, varied tea, without the need to bring in leaves from other mountains. It's an excellent way to keep a single-mountain cake lively and engaging. It brews a rich, dark orange. Correspondingly, the feeling is woody and clean, but with plenty of sharpness and liveliness to keep things interesting (and to remind us that this cake could very easily improve further, given another eight years). My mouth waters long after the swallow, as the sweetness grips hold of the tongue and squeezes tightly. It is on the simpler side, and yet it is aged so properly, and comforts the stomach so well, that its £20 price-tag looks like a huge bargain. I'd be happy to make this charming, woody tea a regular guest at our tea-table. As always, thanks again to Keng for a mighty fine tea session. Recalling that this tea has entered the "stable, woody" zone, I felt confident in using lots of leaves. The result has a heavy, dense soup (pictured above) that had the long-lasting sweetness of sharp, but welcoming, rosewood. In the dense, red humidity is a complex character of old fruits: apricots, plums, and so on. 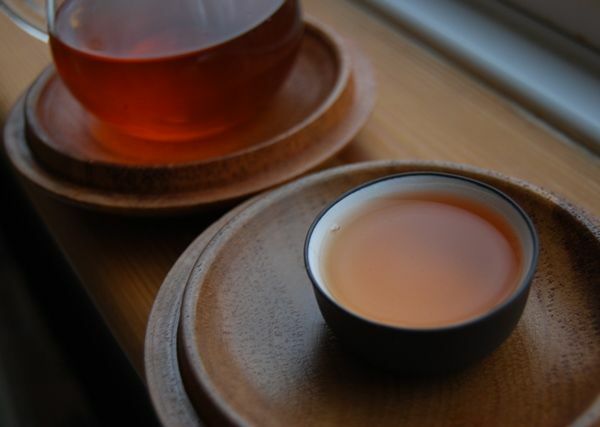 It requires long brews after the third infusion, and is impossible to overbrew, suggesting that it is not the world's most potent tea, but it is comforting and continues to impress. Certainly, for £20, it far exceeds expectations and is a delight to revisit. Did you have a good Christmas? I certainly hope so. Chrimble at my family home is an odd affair. I'm 6 feet tall, and am the shortest of the family, which is almost exclusively male - the odd female* is drafted in every now and again for the purposes of creating the next generation of thugs. Family meetings are like the reunion of a rugby club. *Chinese, in my case, or Japanese, in the case of my cousin. 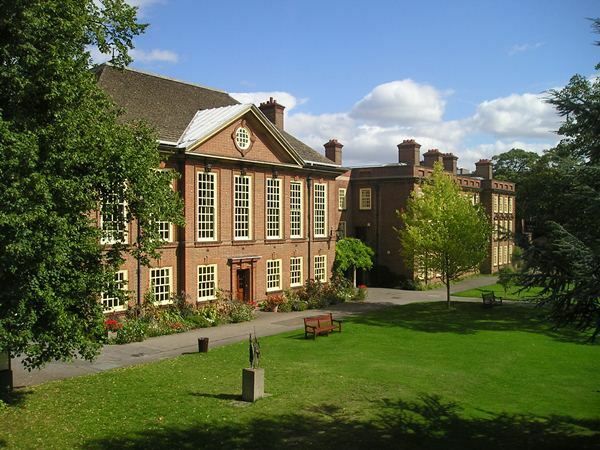 This is a "yard", much beloved by students for its ability to contain approx. 2.4 litres of (typically quite grim) beer. Thus, after fuelling ourselves on a large Christmas lunch, it was only natural that the twenty- and thirty-something males in our brood ended up on the farmhouse doorstep timing one another in the consumption of unpleasant Belgian lager*. Amusingly, the family record for consuming the yard is held by my female cousin, Naomi, who now has a family of two children of her own (both of whom are tall, violent boys). *If indeed one could call Stella Artois a Belgian lager (and which is colloquially blessed with the charming pseudonym "Wifebeater" in the UK). Of course, despite picking up bad habits at university, the men in my family, being English, are naturally uxorious. It is the women in the family who hold the real power, but our wives and girlfriends allow us the illusion of freedom. It is telling that I write this entry in between running to a nearby room to ask if my dear wife needs help with Xiaohu. Christmas was an excellent opportunity to introduce the Big Man to his relatives. "Whatever you do, don't let Chinese Mama see that." Such was the advice of my dear wife, who shows remarkable tolerance of my tea habit. Our collection is quite humble in comparison to those truly mighty hoards amassed by many in the world of pu'ercha, but it is getting a bit sizable, nonetheless. I keep an inventory of our cakes, primarily so that I can remember what it is that we have on our shelves, but also as an amusing game of observing how the prices have changed since we bought them. The spreadsheet reports that the total cost to us is now a number I'd rather not consider, which is terrifying. Though I wouldn't sell them, and don't believe in collecting for any reason other than drinking, I often wonder at their current value. The majority are younger than 2003, so perhaps the difference in value isn't too great. As I unpacked our cakes onto the shelves, I realised that most of them had been stored in large boxes for the last three years. Due to constant house moving and refurbishing, it has been that long since I've been able to access the entire lot. To see them all together is disconcerting... but the room smells brilliant.